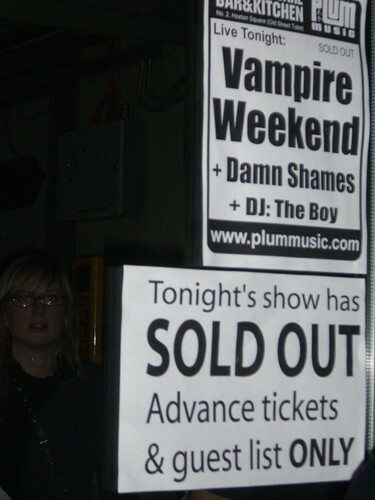 On Saturday night I saw Vampire Weekend for the last time. They were as entertainingly dazzling as they have ever been but my giddy schoolgirl obsession has to stop. I’ve seen them live six times this year. They’re undoubtedly my ‘band of the year 2008’. But it’s just different now. Not as innocently exciting as it was before. In Hoxton in January, they played their second UK gig to a tiny capacity crowd. Their album was yet to be released and I’d only heard what they’d put on Myspace. A friend and I exercised our superior financial power to bag some tickets on eBay at a vastly inflated price: we were blown away by an electric gig. A few months later they played Audio in Brighton, again to a small congregation and they were at the height of their intelligent, charming, humble powers. Lead singer Ezra Koenig coquettishly teased the crowd with his impish eyes through Oxford Comma and majestic drummer Chris Tomson (in my opinion the star of the outfit) energetically pushed the gig along. And as the crowds got bigger, the venues more roomy, the band was just further and further away. I’m thrilled by their success, which is so richly deserved, and I look forward to their ‘difficult second album’ but I’m the boy who fell in love with the gawky girl who became the prom queen. It’s time to find someone else. One Response to Vampire Weekend: the end of the affair.